I have this daughter that I love dearly; her dreams, her imagination and her tenacity actually warm my heart daily. What I do not love dearly is the expense – dance, fashion, hair; the list is just endless. I am always on the look out for a new line of clothes for my little lady that is both reasonable and appropriate. 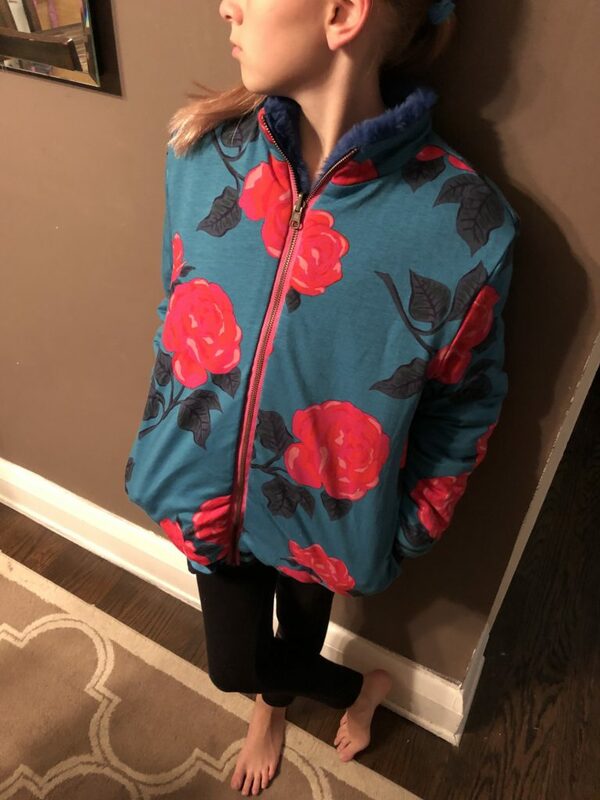 Please consider checking out the great line from Matilda Jane that I am incorporating into my holiday shopping list this season! Lets start with the dresses they offer; oh the fabulous dresses! Each are colorful and bright and bring contrasted patterns to life! They have flowers meet stripes, cute arrows, polka dots you name it! These are cute but sophisticated and really comfortable. 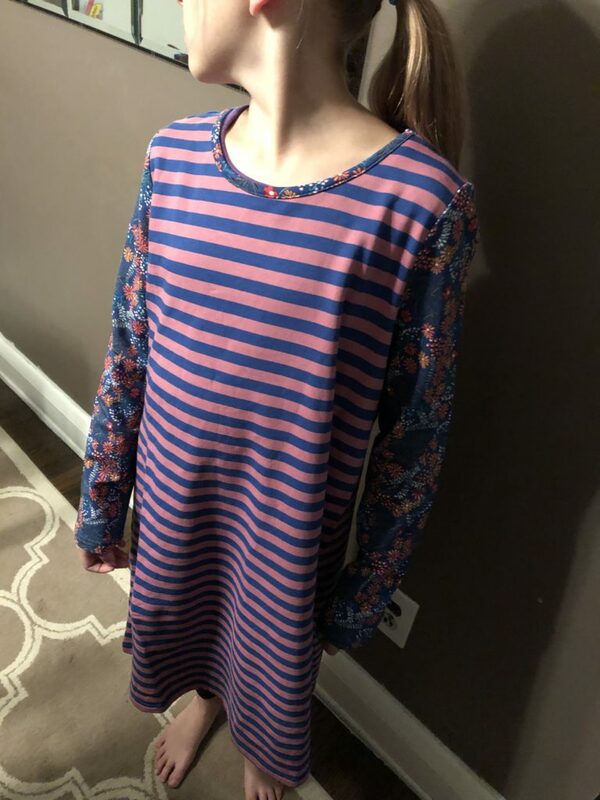 My daughter will be wearing Blitzen’s Ball Dress on Thanksgiving – this cotton spandex t-shirt dress is perfect for a little excess eating! She is very picky with a dress; it can never be constrictive and this line certainly doesn’t disappoint. She will be heading out the door with a cute pair of tights and booties and ready for the day! Dresses range in the $50-60 area. Sizing is 8-16. They run true to size in our opinion. Next up are the tops; they offer a range of t-shirts, sweatshirts and tunics. Each one has this sort of young and bright spirit that is almost hard for me to describe. They are each light, airy and full of almost a feeling that these girls can do anything! Some have flared arms, some flared bottoms, some have hoods – but I can assure you each one has some serious girl fashionista built right in! Pricing is reasonable and quality is wonderful! Leggings and jeggings please don’t get me started on the comfort. These carry the sophistication and look of denim but are super soft and stretchy! They come in an array of styles and colors and range in pricing around $40-50. I can’t wait for your little lady to check out the quality of these. I actually adore the waistband – it is super thick and comfortable so your tween feels great in them no matter their size! So now onto the jacket that my daughter almost wore to bed last night. Matilda Jane’s Sleigh Ride Jacket is both fashionable as it is economical. 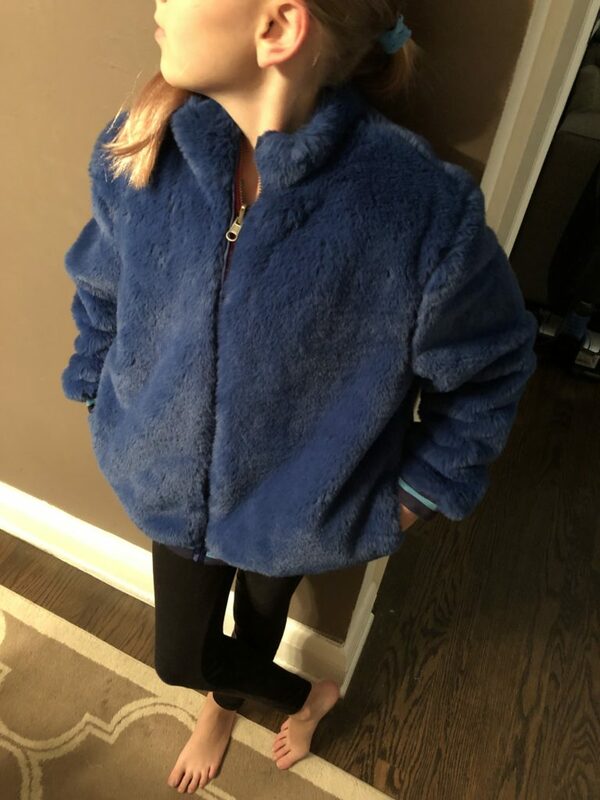 This jacket is one side beautiful blue fuzzy faux fur, the other side super soft bright pink flowers on a soft blue background. Really easy to switch back and forth and to quote my daughter “she may decide to confuse people by switching her look mid-party”. (LOL this child is simply a diva). It is by far gorgeous and priced nicely. Now there are also skirts, pj’s and accessories – If my daughter ends up seeing their cross campus backpack I just know that it will be a late entry addition to her holiday wish list. (I may or may not have just emailed Santa to let him know even I want one). The llamaste in bed pajamas are simply in my daughters words “adorbs” and are a necessary piece for our Christmas Eve festivities! Matilda Jane Clothing is really just so spirited and bright; they offer everything for baby, girls, mom, gentlemen, tweens, and even your home! (Warning: you probably cannot visit their website without checking out the “All Wrapped Up Blanket”. That they offer you for $25 if you spend $175. Also – they have this adorable line of dolls and their accessories that you can just click/purchase and wrap up for under the tree! The company even bundles items up for you; making it super easy to shop! Forget the plastic bowls and jewelry you just don’t need – maybe check out a Matilda Jane trunk show and gather up some friends for a night of fashion? This basically means you can give your friends and family the gift of fashion and possibly earn some freebies for yourself! There you have it – you are all totally welcome for these great shopping ideas! Why bother getting on crowded parkways when you can shop comfortably from home? I have to go; I’m heading out with the diva to grab a latte. I grabbed myself a blue scarf to match her fab blue fuzzy jacket.